Jared Felkins, The Lebanon Democrat, Tenn. The word anaphylaxis isn't generally in the typical high school student's vocabulary unless that student has a food allergy. According to experts, one in 13 children have a food allergy, and Wilson Central High School senior Claire Brown set out to create awareness of anaphylaxis. Brown, who has ambitions of attending Lipscomb University and majoring in agricultural sustainability or possibly nutrition, entered the Get Schooled in Anaphylaxis Challenge after finding the scholarship competition online. For the contest, Brown came up with the idea of how to raise anaphylaxis awareness in her school by getting students together with different interests to create and produce news broadcasts to air on school television networks. 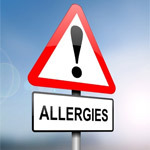 The segments could include interviews with local health professionals, information about common food allergies and signs and symptoms of anaphylaxis. "It is important to encourage the student body to be aware of this health threat, and instead of asking teachers to explain the issue, students have the opportunity to learn together and share their research with the entire school," Brown said. So Brown put the idea in the form of an essay and sent it as her entry in the challenge. "The main purpose of the special news series is to increase awareness of anaphylaxis," Brown said in her essay. "Both students and staff members must be prepared to react in the case of an allergic reaction. By bringing several groups of students together, these news segments can educate the school about life-threatening allergies, and teach them how to respond if someone experiences an adverse reaction. These videos will be beneficial to all who participate, but more importantly they have the ability to save lives." Brown was one of 15 children from first-graders to seniors to win the Get Schooled in Anaphylaxis Challenge. For her efforts, she recently received a $2,000 scholarship to help fulfill her goal of attending Lipscomb University. "Across the United States, seasonal allergies are extremely common," Brown said in her essay. "People complain of runny noses, sore throats, and itchy eyes throughout the peak of pollen season; however, when a local high school health science class begins their study of allergens, more than half the class is unfamiliar with the term "anaphylaxis". In a society with a growing number of patients who deal with life-threatening allergies, it is vital that citizens, and especially students, understand the risks and dangers of anaphylactic reactions." Brown said she prepared to attend an upcoming Future Farmers of America state convention, where she will receive her state degree and compete in parliamentary procedures, during spring break this week. For more information visit anaphylaxis101.com or follow @Anaphylaxis101 on Twitter. (c)2013 The Lebanon Democrat, Tenn.